Luigi's Mansion as it appears in Smash. Unlock criteria Play as Luigi three times in brawls. Luigi's Mansion (ルイージマンション, Luigi Mansion) is a stage in Super Smash Bros. Brawl, Super Smash Bros. for Wii U, and Super Smash Bros. Ultimate. In Brawl and Ultimate, Luigi is fought here for his unlocking battle. 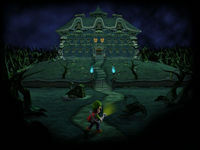 The characters battle on a downsized version of the mansion that appeared in Luigi's Mansion. The mansion's interior rooms will be visible when the characters pass through the mansion's outer walls; similarly, when all of the fighters are outside of the mansion, the mansion's exterior is shown, although this is only if all four quadrants of the building are still intact. By attacking the support pillars, the mansion crumbles section by section until it is all gone. Due to its supernatural origins, though, it will rebuild itself back to its original status after a while. Unlike the destructible towers on Shadow Moses Island, it is impossible to destroy a quarter of the stage if another is on top of it. As the pillars are able to be attacked, projectile users can have problems hitting enemies when they are on either side of them (there are some exceptions like R.O.B. 's Robo Beam). Captain Falcon's Raptor Boost, Luigi's Green Missile, Ike's Quick Draw, Pikachu's Skull Bash, and Jigglypuff's Rollout can also can have problems because of this. Players can also use this to their advantage as refuge from such attacks. Notably, the bottom pillars can only be broken if their corresponding upper pillar is broken first; a bottom pillar still has an active hurtbox, but can never be broken unless its top pillar is broken first. 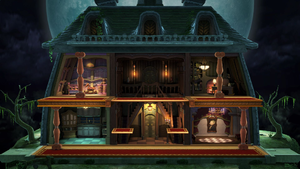 Important properties of the stage are that the mansion provides three levels to brawl on: the ground floor, the second floor and the roof. The roof is the only plain that can be jumped and dropped through - with the exception of a small piece in the center, the middle level has a thickened floor which cannot be penetrated by characters, attacks or items. When the mansion is broken apart completely, the stage layout distinctly resembles Final Destination, with the addition of two minuscule platforms on either side. The platforms rise and fall alternately, much like the ones featured in the Stage Builder, but they can disappear and reappear at random. It is also impossible to glide underneath the stage because the mansion is on top of a small pillar. When playing this stage with more than four players or turning off hazards in Super Smash Bros. Ultimate, the pillars lose their hitboxes, rendering the mansion impossible to demolish. This also provides more freedom for projectile users and characters with rushing moves as the pillars no longer hamper these attacks. In Super Smash Bros. for Wii U, the Ω form is set on the roof of the mansion. Its interior is no longer accessible, thus, it can no longer be destroyed. Star KOs can occur, and the stage extends below the blast line. In Super Smash Bros. Ultimate, the Ω form and Battlefield form are identical to SSB4's Ω form; however, the stage no longer extends below the blast line and the main platform is resized and reshaped to match Final Destination and Battlefield, respectively. The three soft platforms of the Battlefield form resemble the soft platforms of the regular form. 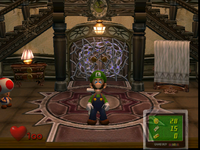 Luigi approaches the haunted mansion, as seen in Luigi's Mansion. The Foyer as it originally appeared in Luigi's Mansion. The front door of the mansion leads into the Foyer, making it the first room Luigi enters. The ground floor has one door that leads into the Parlor and two staircases that lead to the second floor. On the second floor, there are two doors on both sides of the room that lead to separate hallways. In this stage, the Foyer is the middle room and looks similar to how it originally appeared; however, the two doors on the second floor are not there. 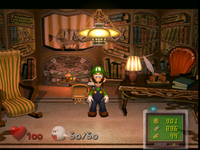 The Study as it originally appeared in Luigi's Mansion. 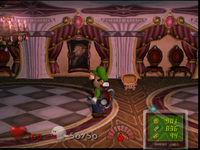 The Study is the room where Luigi encounters the first Portrait Ghost, Neville, located on the second floor on the left side of the mansion. 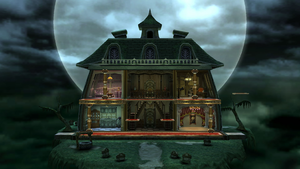 In this stage, the Study is the room on the top right, and its design is similar to how it appeared in Luigi's Mansion. The Nursery as it originally appeared in Luigi's Mansion. The Nursery is where the first boss, Chauncey, is located. This room is located in the same hallway as the Study. The room in this stage is on the top left and looks similar to how it originally appeared. The Ball Room as it originally appeared in Luigi's Mansion. This room is where the Portrait Ghosts The Floating Whirlindas are located. The room is large and has a portrait on the back wall along with spinning checkerboard pattern floors. A replica of the same portrait can also be seen in the Parlor. It is located on the first floor on the right side of the mansion. In this stage, the Ball Room is the room on the bottom right and is much smaller than it originally was. The design of the floor in Brawl and Smash 4 is also different than how it appeared in Luigi's Mansion; however, the floor in Ultimate was changed to resemble its appearance in Luigi's Mansion. 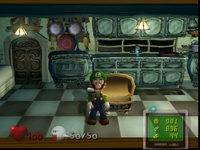 The Kitchen as it originally appeared in Luigi's Mansion. This room is located on the first floor on the left side of the mansion. Luigi enters this room after capturing the Portrait Ghost Mr. Luggs, allowing him to obtain the Water Elemental Medal for the Poltergust 3000. In this stage, the room is on the bottom left and appears very similar to how it originally appeared. Outside the mansion, tombstones and wilted trees can be found. In the courtyard behind the mansion, there is a well where Luigi discovers that Mario is trapped inside a portrait. In this stage, tombstones, wilted trees, and a well can be seen in the foreground in front of the mansion. In Brawl tournaments, Luigi's Mansion has progressively become a banned stage. This is due to its walls which prevent opponents from DIing out of certain multi-hit moves and, as they are solid from all directions, create relevant caves of life and introduce the potential for circle camping. The columns also stop projectiles, limiting approach options for characters which rely on them. When it was legal in more areas, Luigi's Mansion was considered to be one of the best stages for Olimar (due to Olimar being able to survive much longer than normal and use up smashes as well as techs), R.O.B. (due to being able to use down smash and Robo Beam better), and Lucario (due to being able to survive long helping the Aura property). It was also one of the top Meta Knight stages and one of the best Falco and Snake counterpick stages. This stage used to be a major counterpick on the West Coast and in the Midwest, while it was banned on the East Coast. Its potential for circle camping also led to it being banned more often than being a counterpick in tournaments. It is currently banned on a near-universal level at serious tournaments. In SSB4 Luigi's Mansion was never legal in tournaments for the same reasons as with Brawl, and this remains true as of the 2017 recommended ruleset. A big, creepy mansion in the heart of a gloomy forest. It was given to Luigi, who found its many rooms (including a dining room, kitchen, rec room, projection room, music room, and tea room) were infested with ghosts. Luigi was supposed to meet Mario here, but his bro went missing. Not known for his bravery, Luigi gathered his courage and set out to explore his new home. One of the upper pillars being broken up. One of the lower pillars being broken up. Luigi's Mansion in Super Smash Bros. for Wii U. Female Corrin with a Bunny Hood equipped on the stage. Greninja post-Shadow Sneak on the stage. Male Inkling splatting Luigi on the stage. Wireframe Mac and King Dedede fighting on top of the stage. Lunala above the destroyed mansion in Ultimate. Zelda using Farore's Wind on the stage. Zero Suit Samus and Sheik midair on the stage. Added 8-player mode version of the stage (already had an 8-player Ω form). In matches with five or more fighters, as well as in All-Star Mode, all elements of the mansion are indestructible. The hidden Boo texture as seen under the bed in the stage. As shown in a early screenshot of Brawl, the music called Castle/Boss Fortress (Super Mario World/SMB3) was originally intended to be played on Delfino Plaza. The track was moved to Luigi's Mansion for the final version of the game. Underneath the bed, there is a face of a Boo. However, it can only be seen with a hacked camera. 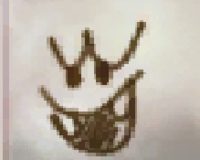 The texture itself (pictured) seems identical to the one found on a Boo Ball in the original Luigi's Mansion. Even though the Foyer's second floor has two doors, they lead to nowhere, because the next rooms don't have doors. Also, in the original Luigi's Mansion, the Foyer's second floor has one door that's on the left. The Brawl version has two doors. Luigi's Mansion, Halberd, and Pirate Ship are the only stages to have their own trophy in Brawl. This page was last edited on April 16, 2019, at 16:05.